The average cost of assisted living in Amsterdam is $3,750 per month. This is higher than the national median of $3,345. To help you with your search, browse the 13 reviews below for assisted living facilities in Amsterdam. On average, consumers rate assisted living in Amsterdam 4.6 out of 5 stars. Better rated regions include Johnstown with an average rating of 4.7 out of 5 stars. Caring.com has helped thousands of families find high-quality senior care. To speak with one of our Family Advisors about assisted living options and costs in Amsterdam, call (855) 863-8283. Located just outside the Albany-Troy-Schenectady metro area, Amsterdam, New York, straddles the Mohawk River. Named after the city in the Netherlands, Amsterdam was once the location of the Professional Wrestling Hall of Fame. The city has nearly 18,000 people, 17 percent of whom are 60 years or older. To accommodate this sizable senior population, there are six assisted living facilities in the Amsterdam area, all of which are licensed, certified and regulated by the New York Department of Health. Like much of the northeastern United States, Amsterdam has four defined seasons. Winters are cold and have large amounts of snowfall, with lows in the teens for at least a couple of months per year. Summers typically are in the 80s, but 90s aren't unusual. Amsterdam is a small city, but there's a lot of art and culture to check out. There's Old Fort Johnson, which is a national historic landmark. There are concerts, festivals and other events along the stretch of the Mohawk River that runs through Amsterdam. Amsterdam has a relatively modest cost of living overall, well below the state and national averages. Housing is less than half of the national average. Other necessities, such as groceries, utilities and healthcare, are about even with the national average. Amsterdam’s crime rate is low: 32 percent lower than the national average for a city of its size and 67 percent lower when it comes to violent crime. The Office for the Aging in Montgomery County will assist seniors with transportation as long as they can prove their age and residency. Seniors must call the office during daytime business hours to arrange a ride within the Amsterdam area. The Amsterdam area has no/few facilities from which to choose in the event of a medical emergency or illness, with the nearest major hospital located in the nearby capital city of Albany. Assisted Living costs in Amsterdam start around $3,750 per month on average, while the nationwide average cost of assisted living is $4,000 per month, according to the latest figures from Genworth’s Cost of Care Survey. It’s important to note that assisted living rates in Amsterdam and the surrounding suburbs can vary widely based on factors such as location, the level of care needed, apartment size and the types of amenities offered at each community. 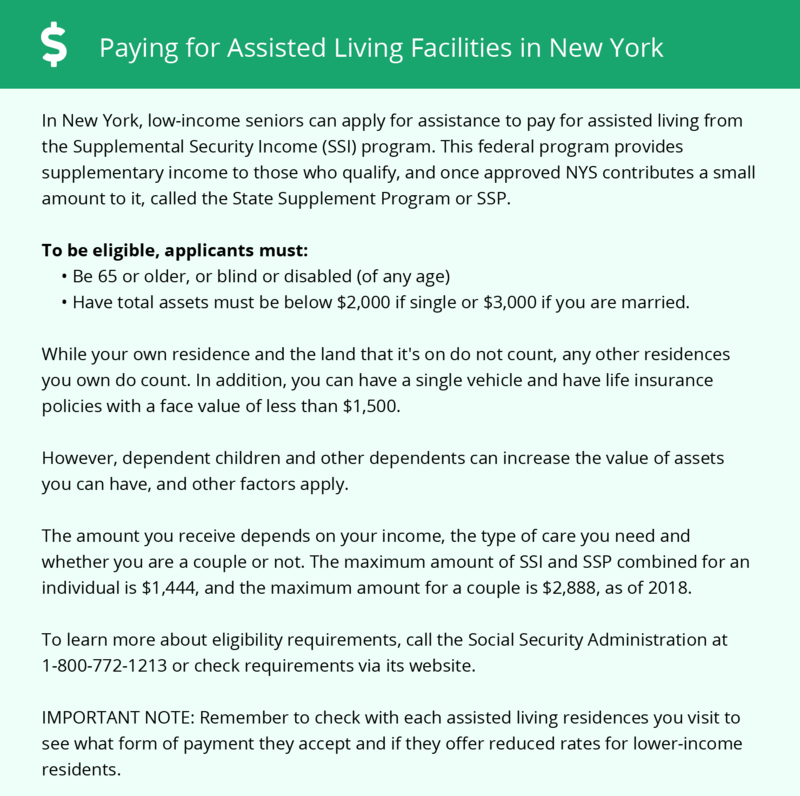 For those seniors in Amsterdam that need financial assistance paying for their assisted living facility, the state of New York offers an Assisted Living Program. For those who qualify, the program will pay for a senior’s assisted living facilities as long as a high level of care is required for participants, equivalent to what one would receive in a nursing home. Most people in this program are on Medicaid, though a small percentage of people who aren’t still may receive financial assistance. Learn more about these programs, plus who’s eligible, on our Assisted Living in New York page. For more information about different ways to finance assisted living, visit our Assisted Living in New York page. Amsterdam and the surrounding area are home to numerous government agencies and non-profit organizations offering help for seniors searching for or currently residing in an assisted living community. These organizations can also provide assistance in a number of other eldercare services such as geriatric care management, elder law advice, estate planning, finding home care and health and wellness programs. To see a list of free assisted living resources in Amsterdam, please visit our Assisted Living in New York page. Amsterdam-area assisted living communities must adhere to the comprehensive set of state laws and regulations that all assisted living communities in New York are required to follow. Visit our Assisted Living in New York page for more information about these laws.